In the SouthEast we have been enjoying the combination of warm and wet weather of Ireland. It seems the rain and the sun is dancing from county to county! On a beautiful Wednesday evening last week, we had our final meeting in New Ross, the last before the new September term. We'll be back meeting on 26 September when we'll hold our AGM. 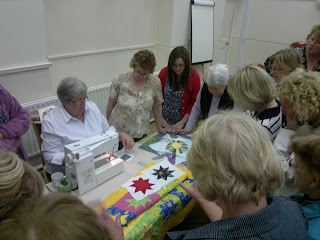 In this May meeting, Mary demo'd the Dresden plate piecing and Eileen shared a square-in a-square technique. We love when our members take the time to make samples and talk through the steps. Also at this time, Fr. Richard Lawless spoke regarding the July 1-8 exhibition of quilts in St. Aidan’s cathedral in Enniscorthy. Thanks to collective efforts, there will be 90+ quilts representing of the SouthEast quilters at this celebration of Augustus Welby Northmore Pugin, gifted designer of the 19th Century and St. Aidan’s cathedral, the largest church Pugin built in Ireland. 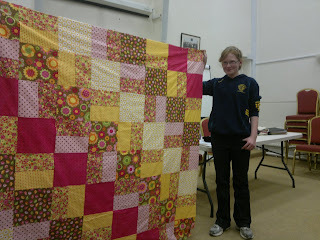 Anne Marie did show and tell with her 12 year-old daughter Maggie sharing her largest quilt. Summer is here and despite the break from meetings, quilting marches on. The Crossroads exhibition call for entries is drawing to a close--contact Loretta O'Brien at loretta@aspennet.ie before close of bank holiday of June for details. Several of our members are sharing a lift with Kilkenny IPS members to visit the International Quilt Festival of Ireland for June 7-9. We hope to see you all there. Deadlines are nearing for the IPS National Exhibition call for quilts. Be sure to be in touch with the Limerick IPS branch regarding how to enter your quilts. Festival of Quilts is on as usual in August. Check it out!